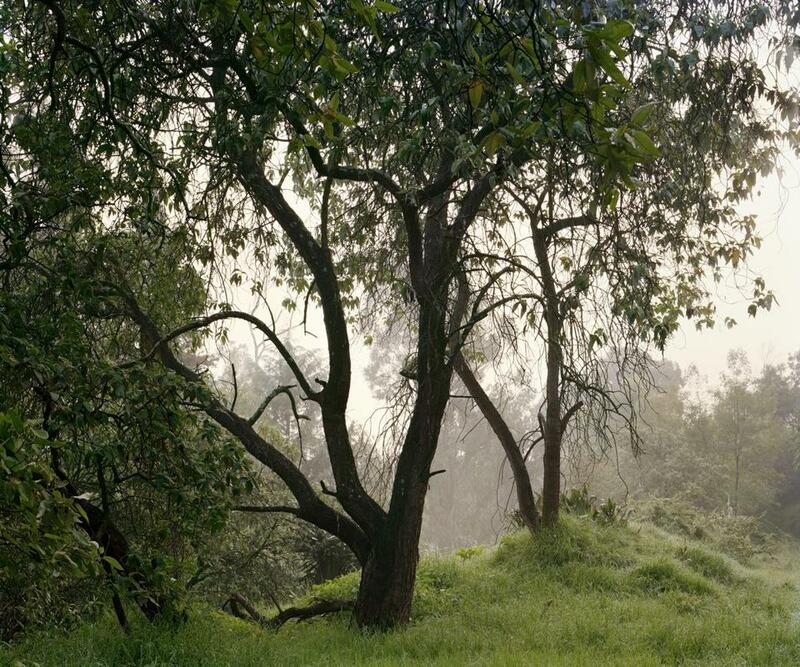 Janelle Lynch’s “Untitled 5,’’ from her “La Fosa Comun’’ series that is part of the “Los Jardines de Mexico’’ exhibit. You don’t have to know much Spanish to figure out that “Janelle Lynch: Los Jardines de Mexico’’ is about Mexican gardens. The show runs at the Photographic Resource Center at Boston University through Jan. 28. Part of the beauty of the show is how loosely Lynch defines “garden.’’ It can take the form of a disused urban playground, an old burial ground, plants growing in odd urban corners, or a cloud forest. The forest is in Chiapas. The other sites are in Mexico City. Lynch lived there between 2002 and 2005. Lynch clearly delights in defeating expectations. One doesn’t think of Mexico as being all that green. So the verdancy most of these 17 pictures display - display? glory in - comes as a surprise. Not that greenery is required for natural beauty. The six photographs in “La Fosa Comun’’ (Common Grave) show a setting of paradoxical fecundity: death and fertility braided together. And the handsomest thing there is the tree branches. Gnarly, twisty, expressive, they have a ballerina’s grace - and a prima ballerina’s sense of mystery. The most beautiful of the four series is the urban spaces. It’s not a conventional beauty, of course, and it’s that unconventionality which first catches the eye. “Donde Andaba’’ (Where I Walked) consists of three small triptychs showing sidewalks and corners with weeds or other plants growing up or out through cracks. The images are delicate, precise, and rather enchanting. They may stretch the definition of garden to the limit, but they don’t stretch the definition of enchantment. Lynch calls her cloud forest series “Akna.’’ That’s the Mayan word for mother and the goddess of fertility and birth. The three very large images from the series (they are 50-by-60 inches) are monuments to the regenerative process. They show tree stumps with ferns, mosses, and other plants growing from them. The delicacy of the shoots in “Bertha,’’ for example, provides a splendid visual complement to the stump’s woody thickness. That juxtaposition is an example of Lynch’s keen eye. Another is how cleanly a swing set frames some graffiti in the background of one of the playground pictures. No people are visible in any of the four series. That makes sense for the other three, but it’s a bit unsettling here seeing slides, climbing structures, and the like lost in lone, lorn decay. It’s never really been settled whether a sound is made if a tree falls in a forest with no one there to hear it. A more pressing question, perhaps, is if it is still a playground if no children play there. There’s no doubt that it can be a garden, though, if by garden we mean the intersection of human landscape, natural beauty, and Lynch’s camera.